The resort recreates a Mayan village setting with narrow paths and charming three-story bungalows. 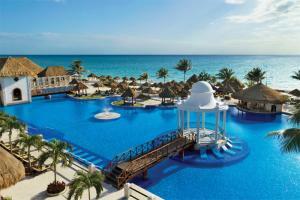 This resort is ideal for a family vacation, romantic getaway or a large celebration. Experience Unlimited-Luxury® where everything is included. Caribbean Market Place - Buffet dining for breakfast, lunch, and dinner; Tequila Grill - Mexican cuisine; Capri - Mediterranean selections; Sumire - Japanese meals including Teppanyaki and Sushi Bar; L'Hermitage - Upscale French cuisine.